Christmas at Grey Sage tells the story of Maude and Silas. They live near Santa Fe, but usually go away for a quiet Christmas together. This year an old friend convinces them to open their beautiful home as an inn. An interesting and disparate group of travelers visits. When a snow storm keeps everyone inside at the inn, lives are changed. I found this book very intriguing from the first chapter. It begins with a flashback to Christmas 1973, when Maude and Silas are making a special holiday for their little boy Elan. But there is a mysterious reference: "... there would only be nine more Christmases celebrated at Grey Sage" (p. 7). This sets the tone of the book and provides foreshadowing about how these people's lives are going to change. I always enjoy books that put a diverse group of people together, and that was an interesting aspect of Christmas at Grey Sage. The visitors to the inn include "a retired military officer, an aging ballerina, a religion professor with his wife and a son who's recuperating from war injuries, a pharmacist and his music-teaching wife, a grieving widow who's a psycho-therapist, her daughter ..." (p. 14). As the story unfolds and we learn these characters' secrets, there is warmth, understanding, and genuine healing from the past. 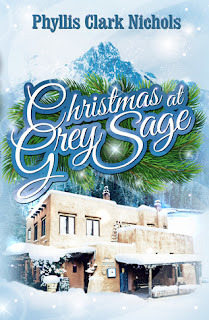 Christmas at Grey Sage was a lovely read, and it would make a great Hallmark movie. I recommend it to anyone looking for a sensitively told, unique Christmas story. Phyllis Clark Nichols believes everyone could use a little more hope and light. Her character-driven Southern fiction explores profound human questions from within the simple lives of small town communities you just know you've visited before. With a love for nature, art, faith and ordinary people, she tells redemptive tales of loss and recovery, estrangement and connection, longing and fulfillment, often through surprisingly serendipitous events. Phyllis grew up in the deep shade of magnolia trees in South Georgia. Now she lives in the Texas Hill Country with her portrait-artist husband, where red birds and axis deer are her ever-ravenous neighbors. She is an English major and classically-trained musician, seminary graduate, concert artist and co-founder of a national cable network for the health and disability-related programming. After retiring as a cable network executive, Phyllis began leading mission teams to orphanages in Guatemala and now serves on three non-profit boards where she works with others who are equally passionate about bringing hope and light to those who need it most. 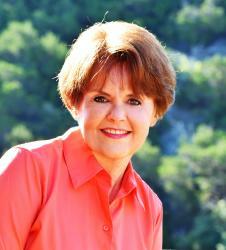 Find out more about Phyllis at http://www.phyllisclarknichols.com. Matthew and Marilla Cuthbert, middle-aged siblings who live together in the fictional town of Avonlea on Prince Edward Island, decide to adopt a boy from an orphan asylum to help on their farm. But owing to a series of mishaps, the child who is delivered to their care is not a boy at all but a precocious girl of 11 named Anne Shirley. Although, as Marilla dryly informs her, "you certainly have a genius for getting into trouble", with pluck, imagination, and optimism, Anne flourishes at Green Gables. And Matthew and Marilla find their lives transformed and their hearts opened to a deeper love than they ever knew possible. 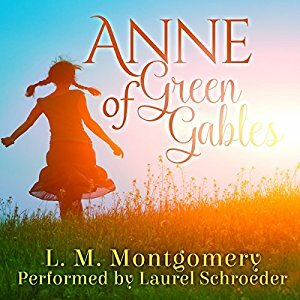 Anne of Green Gables tells the story of an orphan named Anne Shirley, who goes to live with a middle aged pair of siblings on Prince Edward Island, Canada. Although Marilla and Matthew Cuthbert had planned to take in a boy to help around their farm, they unexpectedly decide to let Anne stay. Her warmth and imagination changes their lives, as they also change hers. This is a classic children's novel, and I have read it several times in the past. I really enjoyed this reread, especially in audiobook format. The book came alive with the narration by Laurel Schroeder. She did a great job of characterizations, especially Anne's emphatic line deliveries and sense of drama. I loved visiting with Anne in this story, and seeing the ordinary world through her sense of wonder. I especially like the fanciful names she gives to everyday people and places. I also really appreciated the way she sought out kindred spirits and her strong, loyal devotion to friends. Anne of Green Gables is such a lovely book, about friendship and imagination and the power of home. It was a pleasure to read again, and I recommend this audiobook adaptation highly. It would make a wonderful trip listen that parents would enjoy as much as children. It also would be great as a bedtime listen. I received a copy of this book from Audiobookworm Promotions.